The IMAX documentary is speeding toward Blu-ray and Ultra HD Blu-ray in July. In an early announcement to retailers, Shout Factory is preparing 'Rocky Mountain Express' for Blu-ray on July 12. An Ultra HD Blu-ray version will also be released on that same day. Produced by The Stephen Low Company, ROCKY MOUNTAIN EXPRESS is the passionate undertaking of award-winning filmmaker Stephen Low, director of more than fifteen projects for the giant screen, including TITANICA, SUPER SPEEDWAY and ULTIMATE WAVE TAHITI. Kindled in childhood, Low’s love of high-fidelity cinema and his fascination with the steam locomotive have come together in this captivating cinematic experience that brings alive the magic and drama of the steam age for audiences of all ages. Exhibited in IMAX and other giant screen theaters, the award-winning film has developed an unprecedented and devoted world-wide following. 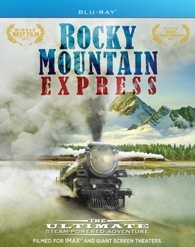 ROCKY MOUNTAIN EXPRESS propels audiences on a steam train journey through the breathtaking vistas of the Canadian Rockies and highlights the adventure of building a nearly impossible transcontinental railway in the age of steam. The film weaves together spectacular IMAX aerial cinematography, archival photographs and maps, and the potent energy and rhythms of a live steam locomotive to immerse audiences in this remarkable story. Suggested list price for the Blu-ray is $19.99. Suggested list price for the Ultra HD Blu-ray/Blu-ray/Digital Copy combo pack is $39.93. 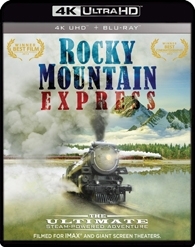 You can find the latest specs for 'Rocky Mountain Express' linked from our Blu-ray Release Schedule and our Ultra HD Blu-ray Release Schedule, where it's indexed under July 12.